The Aalto Vase, also known as the Savoy Vase, is a piece of glassware created by Alvar Aalto and his wife Aino that has become an internationally known iconic piece of Finnish design. It became known as the Savoy Vase because it was one of a range of custom furnishings and fixtures created by Alvar and Aino Aalto for the luxury Savoy restaurant in Helsinki that opened in 1937. 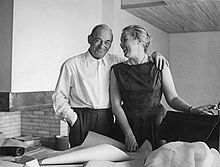 Aino Maria Marsio-Aalto was a Finnish architect and a pioneer of Scandinavian design. She is known as a co-founder of the design company Artek and as a collaborator on its most well-known designs. As Artek's first artistic director, her creative output spanned textiles, lamps, glassware, and buildings. Artek is a Finnish furniture company. It was founded in December 1935 by architect Alvar Aalto and his wife Aino Aalto, visual arts promoter Maire Gullichsen and art historian Nils-Gustav Hahl. The founders chose a non-Finnish name, the neologism Artek was meant to manifest the desire to combine art and technology. This echoed a main idea of the International Style movement, especially the Bauhaus, to emphasize the technical expertise in production and quality of materials, instead of historical-based, eclectic or frivolous ornamentation. Villa Mairea is a villa, guest-house, and rural retreat designed and built by the Finnish modernist architect Alvar Aalto for Harry and Maire Gullichsen in Noormarkku, Finland. The building was constructed in 1938–1939. Paimio Sanatorium is a former tuberculosis sanatorium in Paimio, Southwest Finland, designed by Finnish architect Alvar Aalto. Aalto received the design commission having won the architectural competition for the project held in 1929. The building was completed in 1933, and soon after received critical acclaim both in Finland and abroad. The building served exclusively as a tuberculosis sanatorium until the early 1960s, when it was converted into a general hospital. Today the building is owned by Turku University Hospital but is not functioning as a hospital; rather, the building has functioned as private rehabilitation center for children since 2014. The sanatorium has been nominated to become a UNESCO World Heritage Site. Vyborg Library is a library in Vyborg, Russia, built during the time of Finnish sovereignty, before the Finnish city of Viipuri was annexed by the former USSR and its Finnish name was changed to Vyborg by the USSR authorities. "Seeing how people in the past were able to be international and unprejudiced and yet remain true to themselves, we may accept impulses from old Italy, from Spain, and from the new America with open eyes. Our Finnish forefathers are still our masters." Jarl Gunnar Taucher, was a Finnish architect who first came to prominence in the first decades of the 20th century for his architecture designed in the style of Nordic Classicism, though later he turned to the Functionalist modernist style. Georg Hilding Ekelund was a Finnish architect, from 1950 to 1958 a professor of housing design at Helsinki University of Technology and from 1931 to 1934 editor-in-chief of the Finnish architects' journal Arkkitehti. His career as an architect spans the change in styles in Finland from the Nordic Classicism of the 1920s to the Modernism of the 1970s. Maire Eva Johanna Gullichsen was a Finnish art collector and patron. She was a co-founder of the Artek furniture company. Pori Art Museum is based on Gullichsen's art collection. Huonekalutehdas Korhonen Oy, formerly called O.Y. Huonekalu- ja Rakennustyötehdas A.B is a former furniture producer located in Littoinen, Kaarina, Finland. The company is known particularly as producer of Alvar Aalto designed furniture. The Alvar Aalto Museum in Jyväskylä, which is a museum specialised in architecture and design and functions as the national and international centre on all things Aalto. Yrjö Aulis Uramo Blomstedt was a Finnish architect and professor of architecture at the Helsinki University of Technology. He was a renowned modernist architect and architectural theoretician in the decades following the Second World War. Blomstedt was born into an architect family: his father Yrjö Blomstedt was an architect known for his National Romantic Jugend architecture,while his older brother Pauli E. Blomstedt was until his premature death at the age of 35, a pioneering early modernist architect. His other brother, Jussi Jalas, was a composer. Blomstedt was married to Heidi Blomstedt, the daughter of the composer Jean Sibelius. They had two children, the artists Juhana Blomstedt and the architect Severi Blomstedt. Villa Skeppet is a home designed by the Finnish modernist architect Alvar Aalto for his friends Christine and Göran Schildt in Ekenäs, Finland. The building was constructed in 1969–1970 and was the last home he designed.